Show your love of Stephanie Meyer's best selling vampire novels with any one of these inspiring Twilight tattoos. Whether you're on Team Edward or Team Jacob, Twilight tattoos are a great way to commemorate the story of forbidden love between a human and immortal. Similar in story to Romeo and Juliet, Twilight is an action packed teen drama that tells the tale of true love between high school girl, Bella Swan, and high school vampire, Edward Cullen. After moving to the small town of Forks, Washington, Bella meets and falls in love with Edward before finding out his true identity. Throughout the series of four books, Bella and Edward and the entire vampire pack are joined in forces by a pack of werewolves eventually lead by Bella's best friend, Jacob Black. Together, the two unlikely teams work together to stop any evil that threatens the existence of the Cullen vampires and the innocent Bella Swan. Channeling the books, Twilight fans are usually divided into two teams, Team Edward or Team Jacob. Whether you hopelessly root for the love between Edward and Bella, or share hope that Bella will eventually see Jacob as a better fit before making the permanent choice to become an immortal at Edward's hand, you can display your affliction for this teen angst drama with a befitting Twilight tattoo. Get inspired with any of the following ideas. Look to Twilight book covers for inspiration. Celebrate the love between Edward and Bella or simply share your own desire for Twilight's hunky leading man with an Edward tattoo. Since Edward is a vampire, you can display any type of vampire-themed tattoo to get the look. Consider vampire bite marks or fangs for a unique pick. While fang marks can be hidden and worn on the inner wrist, a daring tattoo enthusiast may choose to put them in a prominent position at the neckline. 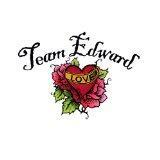 Another Edward pick may be the family Cullen crest; there is plenty of Twilight themed merchandise that can be used for inspiration for an Edward or Cullen tattoo, including the font set for the title and names of the characters. Look at any of the book covers for inspiration, you may find a simple red ribbon as used on the Eclipse cover is the perfect simplistic choice for a tattoo that would only be distinguishable amongst other Twilight enthusiasts. If you're rooting for Jacob Black or his werewolf pack, you can opt for any sort of Native American inspired tattoo design, including the dream catcher that Jacob presented Bella Swan for her 18th birthday. In addition to tribal art, a werewolf tattoo makes a likely choice for the Jacob Black fan. Consider the friendship between Bella and Jacob, and the love triangle involving Edward when you opt for a Jacob inspired tattoo. Perhaps a torn heart would make a unique representation of Jacob and Bella's love. A tribal armband or lower back symbol is a unique style and placement for a traditional Native American symbolized tattoo. While Twilight tattoos are a great way to celebrate and show your love for one of the most popular teen dramas, consider the permanence of the design prior to making the commitment. Pop culture tattoos eventually lose their charm over time; don't get stuck with a tattoo commemorating a book rather than your own individuality. Opt for your own initials in a crest similar to the Cullen crest, or leave the names off of any tattoo symbol to make your Twilight tattoo more personalized. You can still pay tribute to the hopelessly romantic drama between immortal and human without losing your own identity. Rather than go for a permanent piece, show the world you're a fan of either Team Edward, Team Jacob or Bella Swan with a temporary design instead. Roses, crests, thorns and torn hearts are all along the lines of a vampire themed tattoo. Test a temporary piece of artwork out first before you make the switch to an immortal and everlasting design.